If you need context for that title, check this out. Breakfast is hard. Mostly because I don’t get hungry until about 11, but they tell you you’re supposed to eat within 30 minutes of waking up to boost your metabolism. I’ll be perfectly honest here and say that sometimes 11 and “within 30 minutes of waking up” are not always that far apart….but that aside, sometimes I just want a cup of coffee and for everything else to somehow make itself. Also, since I don’t really care for breakfast (on the weekdays – weekends are another story full of bacon and cheesy scrambled eggs and toast with strawberry jam), I try to make it as healthy as possible since my taste buds haven’t always totally woken up. Last week I had gotten a few local peaches from my co-op and when I got up that morning, somehow all the cereal, bread, jam, and milk had magically disappeared. So I opted for oatmeal with peaches. I told you when I started this blog, there would be some major fails. This one wasn’t major, but it was a misstep – the directions on the oatmeal said to add a 1/4 tsp of salt to the oats while they were cooking. I cut the recipe in half, since it was just me and just threw in a “dash” of salt. Well, either these instructions are bobo to begin with, or my brain is so dysfunctional in the morning that my “dash” was actually a giant pour and this was the saltiest oatmeal I’ve ever had in my life. I tried to add some cream and honey to it to tone it down, but to no real avail. 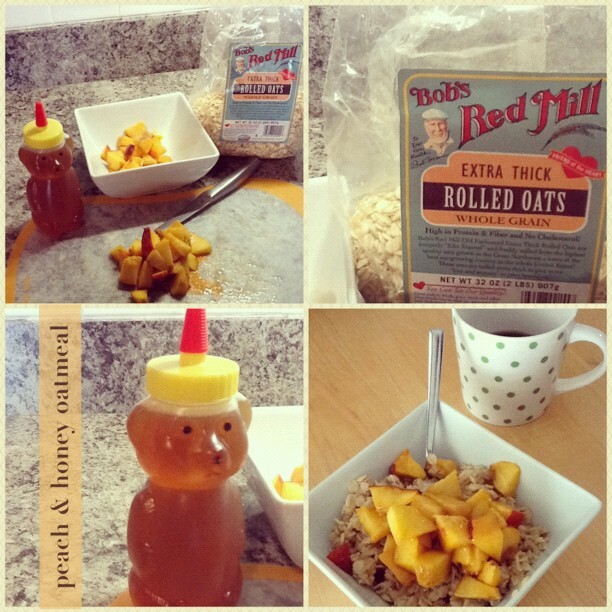 I ended up just mostly eating the peaches with a little bit of the oats. My advice: just don’t put salt in oatmeal. Seriously, whose idea was that anyways? So despite the salt-lick fiasco, let’s talk about the benefits of this meal while pretending it didn’t taste gross. First off, oats are a whole grain, and rolled oats are a less processed version of a whole grain. I’d like to say I can stomach steel cut, as-little-processing-as-possible oats, but I can’t. They’re just gross and should be reserved for horses. Thick rolled oats are my in-between healthy option. I get this brand from the organic/natural aisle of the grocery store. They take 10-20 minutes to cook. Word to the wise – if your “whole grains” take less than 5 minutes to cook, they aren’t really doing you any good. Whole grains are good for your heart, cholesterol, blood pressure (reducing the likelihood of having blood clots, stroke and heart attack), and provide you with folic acid, fiber, b vitamins, iron and more. You can find out more about the benefits of whole grains on the whole grain council website. Honey is full of antioxidants, is a great way of sweetening food without giving you a sugar rush because of its quick glucose and slow fructose release and if you suffer from seasonal outdoor allergies, locally produced honey can help curb some of those issues because it gives you a healthy, low-dose of the pollen you are allergic to, sort of like a vaccine or an allergy shot would. Find more fun honey info here. Locally produced honey is the best kind to get (of course) because it will provide your system with the local allergens and pollen, because it helps keep your local honey bee population thriving (which is incredibly important for agriculture overall) and because it taste better because it has to go through less processing. I buy mine from Bee’s Knee’s apiary here in Chesapeake, VA. Finally, peaches. Ah, peaches. The epitome of July. The highlight of summer. Who would even care if they had health benefits or not, they are so good? But, luckily, they are full of potassium (low potassium is the source of MANY health issues including hypertension, fatigue, muscle weakness and more), beta-carotene (which your body turns in to Vitamin A), lycopene and lutein. They are also high in fiber and vitamin C. It’s important to note that while almost all vegetables and many fruits are “high in fiber” – the fiber usually resides in the skin of the product. Some fiber is contained in the flesh, but when it comes to things like peaches, cucumbers, apples, etc – if you are peeling them before eating them, you are losing out on a lot of fiber and nutrients. Whole food is the best food. Alright, that’s enough for today’s nutrition lesson. Just remember – skip the salt, use a minimally processed whole grain, leave your fruit’s skin on and skip the sugar and replace it with locally produced honey. And coffee….don’t forget the coffee…..